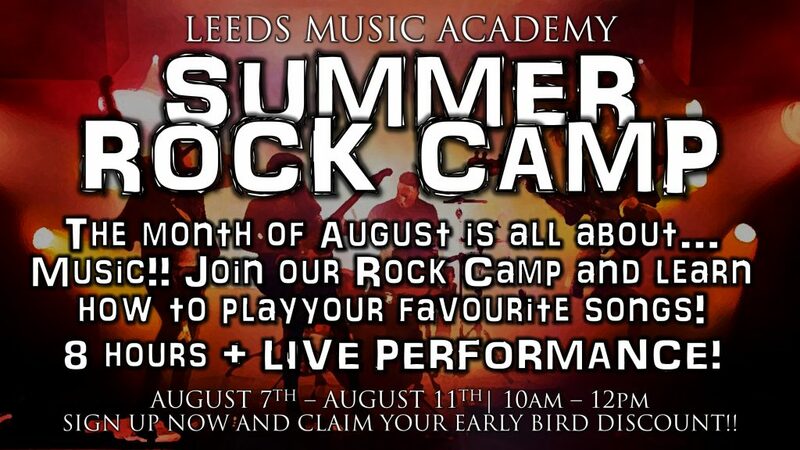 The Beeston-based Leeds Music Academy will be running four week-long music camps for children and young people in August. Rock Band Camp – Want to learn how to play in a band? Then this is the camp for you! £87 for the whole week – and it includes mid-morning snacks! Guitar Boot Camp (Beginners or Intermeadiate) – If playing the guitar is your passion or you wish to start learning this Summer, then these two boot camps are perfect for you! Music 4 Kidz Summer School – Is your child naturally musical? Is she aged 3 to 7 years old? And do you want them to learn while having fun this Summer? Then our Music 4 Kidz Summer School is a no-brainer! Includes an exclusive concert performed by all the campers! £70 for the whole week – and it includes mid-morning snacks! What are these camps all about? Our Rock Band Camp is all about fun, education and a lot of music! It will be held between August 7th and August 10th + a live concert for parents on August 11th! Learn songs in a quick and proper way! Learn how to play in a band like the PROS do! Make friends and be the dream bandmate everyone wants to play with! But if you are into the 6 string axe, then our Guitar Boot Camps are for you! ​We are running two summer camps for guitarists: one for absolute beginners and one for intermediate players who want to improve on their current skill level. Our newest addition to this year’s program is our Music 4 Kidz Summer School! Our weekly Music 4 Kidz class is already a success so this Summer we bring to you our very own Music 4 Kidz Summer School! These will be five days of fun, education, music, games and new friendships! Our Music 4 Kidz Summer School is for children between the ages of 3 years and 7 years old. How do you reserve your space? Visit www.LeedsMusicAcademy.co.uk/summer-camps or email us at info@leedsmusicacademy.co.uk and we’ll take care of everything for you! Give your children a Summer that they will never forget! Leeds Music Academy… Changing Music Education, One Lesson At A Time. This post was written by Joao Figueiredo using our Create an article for South Leeds Life page.